At one time, crystals were rather obscure items found only in mineral collections, museums or laboratories. Today crystals are all the rage and have become a virtual fad. Once available only in uncommon rock shops, nowadays crystals are sold in bookstores, hawked on street corners and expounded upon in workshops. We hear of laser wands, healing stones, celestials…and even find feathered jewelry complete with instruction manuals. Where will it all end? A wise person once said there wouldn’t be so many fakes if a real one didn’t exist somewhere, be it artwork, healers, or even crystals. Thus, there is a reality to crystals and their use. Marcel Vogel, IBM scientist and world renown metaphysician, devoted the latter part of his life to comprehending hidden truths, and in particular the mysteries pertaining to crystals. Utilizing scientific methods and working with a host of volunteers, he pioneered the field of crystal energies. This text presents a description of his research and how crystals actually work. A crystal is a special form of matter. It is a solid with a regular internal arrangement of atoms or molecules. Like all other “living” things, crystals are “born” from a seed and undergo growth processes in their formation. Marcel suggested that a crystal is truly alive only during its growth period or time of formation. When complete it leaves behind a solid body containing the essence of its inner expression. Although its “life” ends after the crystal stops growing, its spirit or oversoul remains accessible within the geometric form it created, and this is available for our use. Crystals have been utilized by mankind throughout history, although particularly so in the past few hundred years. Just as different plants provide a variety of herbal essences, different crystals serve a myriad of functions. For example, some crystals are piezoelectric. This means that they respond to changes in pressure by generating an electrical charge. Early record players took advantage of this. Their needles contained a piezoelectric crystal which responded to movements against grooves in a record to generate current. One place these crystals are found today is in matchless lighters. Crystals resonate to or vibrate at different frequencies, a property which is taken advantage of in electronics. In fact, early radios used tuners consisting of a crystal of lead sulphide, the mineral galena. Marcel Vogel investigated the interaction of crystals with the so-called subtle or etheric forces within nature. He designed several useful tools capable of utilizing etheric and higher energies. These he constructed out of quartz or rock crystal. Why quartz? To understand this choice we must first understand ourselves. The human body consists mostly of water, approximately 70 percent. The formula for water is H2O, meaning a single molecule contains two hydrogen atoms and one oxygen atom. But water is far more complex than this simple formula seems to indicate. On a molecular scale, water is very “sticky,” the H’s from one molecule are also attracted to the O’s of surrounding molecules. Thus, water molecules attract each other and tend to clump together in a network, constantly assembling and disassembling bonds between neighboring molecules. Marcel hypothesized that these molecular “clumps” (actually cells of liquid crystal) are capable of storing information in a manner similar to how computers store data on a disk. The dynamic nature notwithstanding, such information would be permanent and detectable. Marcel believed he had found evidence of this restructuring in spectral analysis of informationally processed water. Water, as ice, forms a crystal of hexagonal symmetry (meaning the shape is six sided, as witnessed in snow flakes) with tetrahedral coordination (that is, each molecule is associated with its four neighboring molecules). Water’s formula, H2O, is the “inverse” of quartz, SiO2. Like water, silica is also hexagonal with tetrahedral coordination. Being a solid, any information impressed upon it is fixed within its macromolecular structure. We can visualize these structures as a kind of vast three-dimensional harp. Information is stored by causing specific bonds to resonate etherically, similar to a musical chord. Unlike a harp, the “sound” (or vibration) never diminishes. Stored information is permanently fixed until one chooses to erase it and begin anew. The molecular structure of water as ice or in liquid crystalline form is fundamentally the same as that of quartz. (Figure 1 illustrates the similarities between the structures of ice and quartz.) Marcel found that information mentally impressed into quartz crystals could be transferred to water. The process was called “charging water,” and once charged, the result was both permanent and measurable. He found that charged water developed a new absorption band in the ultraviolet. This is like saying it changed color! Since early in this century it has been known that quartz is a resonator and amplifier of energy. It is a vital component in many electronic devices. What was not known is that quartz crystal is also capable of amplifying “subtle forces” including thought energy. The reason this had remained difficult to demonstrate is that, regardless of how fine the quality of the crystal tested, the conditions under which it was formed were highly individualistic. Simply stated, no two crystals are identical, and in science, a theory cannot be based on a single case. The amplification of thought energy includes so much “static” (other vibrations) that it becomes lost in the noise. Marcel discovered the answer to this problem. 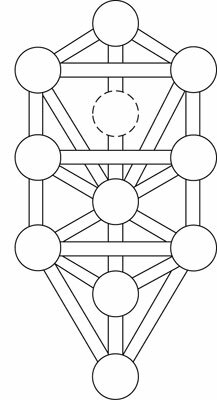 He found that when quartz is cut along the c-axis (the line of symmetry within the crystal perpendicular to all other axes) in the shape of the Kabalistic Tree of Life, it resonates to ONE frequency. It so happens the frequency (which turned out to be 454) is the same vibratory rate he also measured for water. Therefore, Vogel-cut crystals are powerful instruments capable of taking thought impressions and literally injecting them into the matrix of water. From this work he developed three tools: the double terminated healing crystal, single terminated meditation crystal and the Star of David crystal medallion. Figure 2 compares the shape of the healing crystal design with the Tree of Life. This crystal device can be utilized in the directing of healing energy by impressing it with the desire and intention to do so. Although it seems like magic, actually it is more technological. The energy field created by the brain (a bioelectric organ) sets up subtle changes in the energy states within the crystal. This is similar to the “observer effect” recognized by modern physics. As an amplifier, the crystal increases this effect to the point where water can accept the same changes. Marcel demonstrated this in his laboratory. In a repeatedly performed experiment, he impressed the intention “to remain pure” into a healing crystal. Marcel then injected this “information” into fruit juice. He kept two uncovered glasses side-by-side, one treated in this manner and the other as a control. Over a period of months he observed that the treated juice remained clear and fragrant; the control became cloudy, filled with mold and bacterial growth. In a similar manner, the intention to heal can be transferred through a crystal. The body, being mostly water, accepts the charge immediately, often with dramatic results. The healing crystal is double terminated. The points on both ends serve as a focus, enabling the crystal to conduct subtle energies through its body and out the other end. The meditation crystal is single terminated (it looks like a obelisk). This shape affects the mobility of the energy. Force is restrained within the crystal form, enabling the operator to similarly contain their own mental energy within themselves. Thus, it is a very good tool for meditation. Although extensive information on the Star of David medallion is given in a separate text, the following is to clarify its application. C.W. Leadbetter, a member of the Theosophical Society and a powerful clairvoyant, described the astral field surrounding a typical person in his book, “Man Visible and Invisible.” He described it as a virtual miasma of conflicting energies vibrating at so many different frequencies that the average person finds himself subject to a constantly changing mix of feelings and impressions. The overall effect is that one’s vitality is easily drained. He went on to observe that the auras of persons who had managed to obtain some control over their emotional nature had fewer vibrations in their astral field. In highly evolved humans, he observed perhaps 7 to 12 fundamental vibrations and their auras were relatively stable. When the medallion is cleared and then charged, it generates a protective field the “frequency” of love. Vibrating somewhat like a tuning fork, other frequencies are intercepted and dispersed before they can enter one’s energy field. When these energies impinge upon the medallion, they create an interference pattern and thereby, decrease its vibratory intensity. Over a period of time it would totally cease to vibrate and need to be charged again. This is exactly the case! Obviously, the medallion sets up a standing wave in the aura of the wearer, calming and strengthening their astral field so that, with less noise, the wearer can open to or tune into what they choose. Otherwise, they are subject to all the different vibrations around them. The understanding that crystals can be of positive use to humanity is a tremendous realization. The discovery of the mechanism behind this action is of even greater importance. Marcel Vogel’s work remains a milestone in this process. Just as electronics revolutionized physical life, future crystalonics will transform the inner life. The cutting of the aforementioned crystals is a very selective and definitive process. One must be aware of machine-cut crystals or crystals that are not cut on the C-axis. To our knowledge, there is only one individual, Drew Tousley, who is able to successfully hand-cut the Vogel crystals. He trained exclusively under Marcel Vogel for over twelve years. Karin Kabalah Center is a distributor for Vogel crystals, and from time to time workshops on the use of the crystals are conducted at the Center. For additional information or prices on the Vogel crystals, please contact the Center.